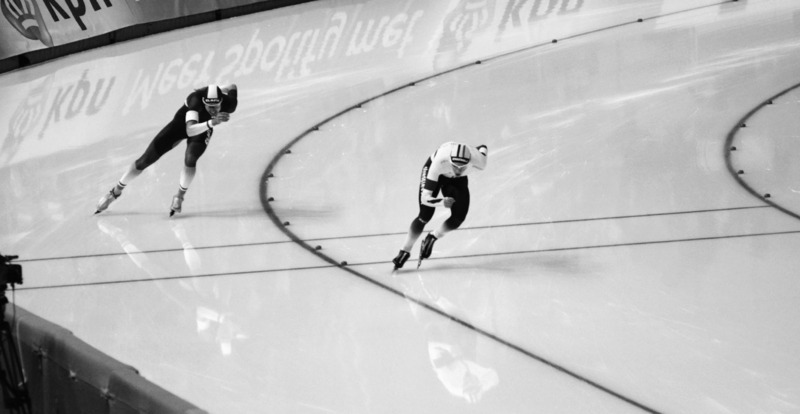 Alexis Contin from France (left) and Bart Swings from Belgium (right) during the men’s 1,500 meter race. Posters line the walls at the Calgary Olympic Oval with past and present Olympians, their stories for everyone to read. Ordinary people who have achieved the extraordinary, the Oval is a place where legends are made. The ISU World Allroundspeed Skating Championships took place March 7 and 8 at the Olympic Oval. Four-time Olympic medal winner Denny Morrison was looking to be one of the favorites going into the event. In the Men’s 1,500 meter event, Canadian Denny Morrison was in the 11 pair to race, in the outside track against Netherlands Sven Kramer. As the men skated up to the start line, making grooves into the ice with their skates, the arena went silent. As the start gun sounded, the room erupted in cheers: the Canadian favourite against the crowd favourite. As they sped around the track, fans went wild. People were blowing horns, waving flags and cheering on the men racing to the top of the podium. Kramer kept a tight lead on Morrison and in the end, beat him for third place by 0.17 of a second. Kramer shared his place on the podium with Bart Swings from Belgium. In second place was Sverre Lunde Pedersen from Norway, and with a time only 1.43 seconds faster than Morrison, Denis Yuskov, from Russia, stood atop the podium. The women’s 5,000 metre was one of the longer races of the day. There were only four pairs racing in this event and two Canadians racing against each other. They were the second pair to skate, with Ivanie Blondin on the inside track and Kali Christ on the outside track. Blondin came in 5th and Christ came in 8th, with Martina Sábliková from Czechoslovakia taking home the gold. The Men’s 10,000 meter was the race that Morrison had made his promise about. With only four pairs in the final race, Morrison and Kramer wouldn’t be going head-to-head, but that didn’t make it any less exciting. As Morrison stood at the start line, the room went silent once again. Up against Denis Yuskov from Russia, Morrison took the outside lane. The audience watched on as the men poised themselves for the start, and with the final start gun of the day, they were off. As the final lap came to an end, it just wasn’t enough for him to keep his promise. Morrison was unable to make up the seconds he needed to place, and ended up in 8th. With an exciting first place in the Men’s 500 metre just a day earlier, this was certainly not the way Morrison planned to end off his weekend. As Sven Kramer stood at the top of the podium for the final time of the day, it was over. Canadian Kali Christ took home the silver medal during the women’s 500 m, with teammate Ivanie Blondin coming in fourth. Morrison came first in the men’s 500 m, which would be the last Canadian medal of the weekend. Next story How does alcohol affect your workout?